This ride travels along the back roads of Novato on Indian Valley Rd and Novato Blvd past horse ranches to Stafford Lake. Climb out of the lake area to Hicks Valley and along the Nicasio Reservoir on Pt Reyes Petaluma Rd for a lunch stop at Pt Reyes Station. The return includes a loop around Bear Valley to Olema Hill and Platform Bridge Rd. The multi-use path off Novato Blvd goes up and over into Stafford Lake; it’s gets you off the main road with beautiful views of the dam and lake. The gorgeous bucolic country scene is a wonderful distraction to the climbs with its rolling green hills, vineyards, ranches and open pastoral lands dotted with grazing cattle. The rolling terrain on Platform Bridge Rd takes you back onto Pt Reyes Petaluma Rd. The flat miles along the Nicasio Reservoir leads to Nicasio Valley Rd. 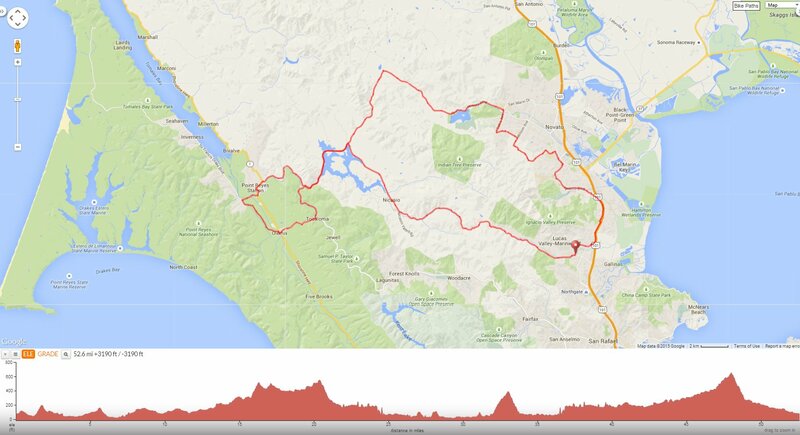 This ride takes you through the redwoods and out along Nicasio Reservoir to Pt Reyes Station. You’ll enjoy the quiet country back roads and the wonderful views of the rolling hills around Marin!